Where my voice finds expression! Staying at home vs. Work: What should you choose? Let’s face it: almost every woman has to face this dilemma where she has to make a choice between working full-time and staying at home as soon as she sees a positive sign on the pregnancy test strip. While most women go with the flow and leave this decision till baby’s arrival, some of them have already made up their minds. There exists a large section of women who would love to work part-time, which seems to be a win-win situation. However, only a few of us have that luxury and the rest are compelled to choose between staying at home and working full-time. If you happen to be a ‘desi (typically South Asian)’ mom, particularly the one living in Pakistan, I’m sure you’ll have your own stories to tell. We all agree that the most favourite hobby of our society (read: nosy, desi aunties) is to criticize others and we consider passing judgments our national right. From the clothes you wear at your wedding to the man you marry, everything is deeply scrutinized by these overly watchful aunties. This habit of prying doesn’t stop here. Once you are married, everybody waits impatiently to hear the ‘good news’. Well before the baby arrives, unwelcomed suggestions start pouring in from all directions and if you happen to be a working woman, the first thing you are told is to leave work. ‘Ab tou araam se ghar mein baitho (now stay at home peacefully)’, ‘Tumhe naukri ki kia zarurat? Shohar acha kamata tou hai! (Why do you need a job? Your husband earns well!’, ‘Ab azadi bhool jao. Ghar sambhalo aur bachay paalo (Now let go of your independence. Sit at home and take care of kids)’ ….. and the list is endless. Even though you treasure your family and love having them around, you will cherish some ‘ME’ time once in a while. You will eventually appreciate that not everything in your life revolves around them. You will be financially independent. Even the thought of it is an instant self-esteem booster and is as gratifying as seeing your little one sleep peacefully! Plus, your husband will feel less burdened and will appreciate your contribution to the household. You’ll stay in the game as far as your career is concerned. Your work will help you stay linked with the larger world, and will satisfy your inherent longing for intellectual stimulus. Your baby will not comprehend the benefits of that additional pay cheque, but there is another incentive he’ll appreciate: he’ll become independent sooner than the children of stay-at-home mothers. You’ll feel guilty leaving for work on those mornings when your restless infant is clinging to your legs or is unwell. You’ll miss spending quality time with your baby and hearing the delightful things he did while you were at work will probably make you sentimental. You’ll be busy juggling between work and home which could affect your health. Bidding farewell to regular home-cooked meals and impeccably folded laundry may not go well with your husband. You’ll be there to witness every little smile and wipe away every tear of your child. Staying at home will reorganize your life and you’ll feel less stressful. You’ll find time to cook delicious biryani for your husband and watch your favourite Fawad Khan drama. You’ll be at more peace to see your baby growing right in front of your eyes. This will keep unnecessary concerns about his diet and poop at bay. Your husband will love to see you all dressed up, waiting for him like a typical ‘mashriqi (eastern)’ wife. On some days, boredom will kill you and you’ll get fed up of cleaning, cooking and poop talks. You’ll miss having some kind of intellectual stimulus. Sometimes you’ll feel your kids are clingier than those of working mothers since, obviously, they’ll be relying only on you. Whether you choose to stay at home or work full-time, it should be your own decision and not influenced by the society. If you can’t work full-time, search for part-time or freelance opportunities. How about getting a diploma or learning a new craft? It’s important to take a break from motherhood once in a while and you’ll get back to changing nappies in a more energized way. Remember, your kids will grow up one day and they’ll be absolutely fine. Trust your instincts. You are doing a great job, mama. Hang in there! Are you a parent whose kids are always up to something? Are you tired of their countless questions? Is it nearly impossible to make them sit still? Well, this blog is for you! We all know how kids are always fascinated about learning new things. Their tiny minds work round the clock and they love to be challenged. Kids of every age are naturally inquisitive and absorb new information through hands-on participation. One of the best ways of making them learn is to involve all of their five senses in the activity. Therefore, it is necessary to plan instructions around stuff that kids can see, hear, touch, taste and smell. Nothing can be better than familiarizing these inquisitive thinkers with science at a young age! Sadly, in our part of the world, science education is more focused on reading piles and piles of books which can overburden even an adult. This is one of the reasons why only a small number of our students study science with their personal interest. A large section still chooses science over other disciplines due to parental/societal pressure. Science education can be overwhelming for a young mind. Therefore, it is vital to take the science-phobia out of a child before he is involved into any science activity. What you have to do is to teach your little champ that science is not all about data, measurements, abundant equations and experimentation. It’s not restricted to limitless reading and writing. In fact, it’s an exciting way to discover the world around you. Expedite your child’s learning by practically involving him in an activity. There are countless scientific experiments you can enjoy together within your own home. Consequently, your kid will learn how simple and pleasurable science is by using simple resources and items lying in the home. While mobile apps are a rage everywhere, science books still remain to be an imaginative source for both knowledge and fun. Several science books can enlighten your kid with scientific concepts and projects through enjoyable, easy to remember, and attractive content. Do not restrict your reading sessions to the course books only. You’ll find heaps of other colourful science books over the internet. Order them today and enjoy a stimulating weekend ahead with your little Einstein! Your kid might be doing lots of science experiments in the school laboratory but it’s just not enough to bring out his love for the subject. It is better to take him out in the open once in a while to diversify his outlook. For example, plan an excursion to the zoo or visit a garden near your home and make him observe different plant species. This will allow your kid to experience the real-world side of science in a stimulating environment. Additionally, communication with fellow little geniuses will make him absorb faster and converse efficiently. Is your kid a game freak? Can he stare at the computer screen for hours without even drinking, eating or snoozing? If yes, you should use computer games and simulations to make him discover science. These games can brilliantly enhance his learning process and make him comprehend scientific ideas and abilities. Many of the activities mentioned above are inexpensive and require no special tools. Your kid might be scoring well in the science course but are you sure he’s actually learning? Get involved with him to explore science in an entertaining way and he’ll sooner or later fall in love with it. Kids are fascinated with whatever type of toy you provide them, at whatever age. Toys are much more that just to be played with, as they also simulate a child’s creativity, activity and imagination. Parents most of the times are not concerned about the types of toys they provide their children with. Only a few parents are actually concerned about the toy being efficient in bringing up their child that not only employs fun but also provides learning aids as well, to exploit the creativity and imagination of the child to a better extent. If you want your kid’s creativity to flourish with some activity and fun, Umagine brings you, the totally-out-of-the-box toy, Doctor Dreadful Zombie Lab. What is Doctor Dreadful Zombie Lab? It is a creative, fun-filled lab themed setup for kids that are fascinated with fictional undead characters in horror movies called “Zombies”. Kids do get excited when it comes to something related to zombies and eating brains. Actually made for boys, it is popular among both boys and girls due to its fun theme. This product stimulates their creativity and curiosity to the level of fun enabling them to prepare candies from the “lab instruments”. It costs around $53.87 at Amazon, rates apply different at other sites. All the items that are manufactured by this machine are edible. With a series of chemical experiments, children can make brains of zombie that are frizzy and gooey, consume the skin and insert bugs in the empty eye socket of the undead head. The undead themed candy machine also provides a drinkable called as zombie puck. The zombie pucks its brains by opening the lower jaw into two parts. The so called Zombie puck is actually a gummy fruit-flavored drink. It sounds a bit weird and nasty, but for kids, believe me, it is a lot more of exciting activity and creative imagination! For the kids who are fans of these undead creatures in horror films, cartoons and comics, this might be the right and sweetest place to invest. Children could enjoy eating the frizzy and oozing zombie brains, consuming bugs and spiders along with the drinkable zombie throw-up. Through this product, they could live up their fantasies and have a good time altogether. Doctor Dreadful Zombie Lab has had positive reviews from most of its customers. They appreciate it much and most of all, kids love it. It is a fun activity for them in which they could move around putting the setup together. They seem to have been enjoying themselves with all the gooey-ness of the jelly brain and the throwing up zombie, it’s more like a treat for children who want to learn at fun’s cost. Not all of the best scientists are sane, but with this toy, children could expand their creativeness and imagination and act like the famous mad scientist who creates zombies out of candy. The thrill of the adventure can drive the kids all the way through fun steps to make their own sugar-coated zombies and engage in a chain of adventures. The brain candy has the texture that is gooey and jelly-like bubbling out of the undead head and tastes like frizzing and popping candy. The zombie vomit seems like being made up of lumpy jelly, tasting like strawberry or cherry. The bugs and skin are made of the same jelly but need moulds and refrigerated for some time or at least 10 minutes according to the instructions to get the perfect semi-solid shape. Different views have been received per personal taste about the food items contained within the toy. 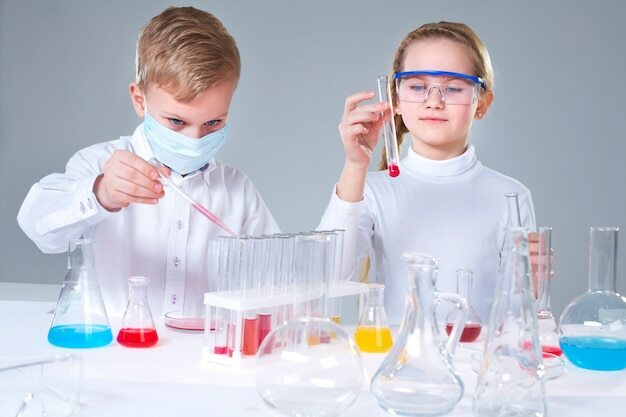 With the directions provided, it allows kids to use their imagination to set up the lab and carry out nasty chemical experiments, which provides them with some basic science knowledge and techniques for future learning. At the end, the kids get sweet candies as a reward. They also learn some measuring techniques and right proportion of the items to prepare their sweeties. The kids, when given toys respective to their age, are able to manage and learn about problem solving. The manufacturer restricts the age from 5-15 years old and not for adolescents. Older kids can use up some help from adults and make their own zombie candy lab. Technology today is automatic these days consuming loads of electricity and batteries restricting a child’s physical ability to actively participate in productive games and sports. The lab set up doesn’t need batteries to work as it is manually handled. This might prove as a plus point in the favor of the Doctor Dreadful Zombie Lab as kids can have all the fun they want, engaging themselves dynamically without having the fear of batteries dying out. Toys nowadays do not allow children to use their imagination to the extent to explore their creative realm. To keep their creativeness intact, they should be provided with simple educational toys. The reason for this toy being popular among kids is that it is simple to handle and make delicious delights. The directions are very easy to use supporting the enhanced educational value of the toy. Kids possibly make mess, but in this way, they could be taught about how to keep their apparatus neat and clean and washing the toy after use. Doctor Dreadful Zombie Lab, running in the market as a successful toy for years, has been discontinued by the manufacturer. It has now become an uncommon product these days and hard to find in the local toy stores. Keeping children busy with their all time favorite toy, this toy has been manufactured since the 90’s and since then is popular among the children. For its quality of being manually handled and fun-at-learning item, it has been a bestseller toy. According to Linda Crowe, PhD and a professor in the Communication Sciences and Disorders Program at Kansas State University, “Children using toys with flash lights and continuous changes and motions, tend to lose their ability to focus and find it very hard to pay attention and indulge in the activities like reading books or playing with motionless toys”. Doctor Dreadful Zombie Lab keeps the curiosity of kids engaged in the experimentation, making the zombie brain frizz and burp with candy. It helps keep them focused at whatever concoction they’re making with measuring techniques and careful observation of the experiments enhancing their focusing and concentration abilities. Because of the zombies, it is very attractive and interesting so the kids are keener to keep their focus from shifting elsewhere. According to most customers, this is the best present to be given on different holiday occasions like Christmas or birthday etc. Kids would be delighted and their holidays be filled with surprise and joy if given their favorite kind of toy. They could use this toy as a specialty on Halloween and get loads of candies. You could even dare your friends to eat the oozing, popping and cracking jelly brain or drink the zombie’s vomit. Kids like the toys which keep them indulged in playing and learning at the same time. Doctor Dreadful Zombie Lab is such fun and interesting that it keeps the kids curious for experimentation and sampling their undead candy. This lab toy for children is manufactured on the basis of child entertainment, aiming to be productive in child learning process being user friendly and employed in a friendly environment. Not only children but the whole family experimenting with Doctor Dreadful Zombie Lab could enjoy as much or kids can even invite their friends over to play with them. Since this toy is aimed for kids to play and learn at the same time, parents have seem to show positive response as they buy this product for their kids and like it as well. They believe that their kids enjoy learning about measuring and combining ingredients to make their candies, providing the parents a sense of relief. They help their kids around with the set up and are pleased to see their kids putting their effort to learn and have a good time. Seeing your kids playing with nasty things is a concern but Doctor Dreadful Zombie Lab fills your child’s desire for grossness with a whole range of nasty and delicious sweets. Following all the directions may take you an hour to set up Doctor Dreadful Zombie Lab, it might get a lot messy while measuring and combining the ingredients, your candy may frizz too much or the zombie vomit makes you nauseous, this toy is worth the time and mess and guarantees all the fun your child needs. The lab setup for the toy is much more durable if kept safe with required precautions. It is not going to last long if not put together according to given instructions. Due to the informative nature of the toy along with the kid’s imagination to use it, it could be used as plaything for mere enjoyment or various educational purposes without any harm. The toy may not turn out to be the same as the one on the box cover or the advertisement, then do not be disappointed with the piece of plastic in your hands. The fancy ads on the television or the realistic-looking-apparatus on the box cover could be misleading, but what the heck! Even if it does not look much like that, it still works as described if all the parts are kept together and does give your kids enjoyable moments with pleasant learning that this toy guarantees. Since the product has been ceased by the manufacturer, it is still available at many toy stores with varying prices. The remaining stock is now sold as a collectable item. Those interested might not want to lose the chance to grab a rare toy. Getting your kids one of these will be their greatest joys as it has become an uncommon product. The candy included with this toy may be a concern for adults who purchase it and the sound of bubbling brain, zombie barf and edible bugs may get them nauseous. It comes as no surprise to know that since the toy has been discontinued, the food items included with it have expired. If the concoction is desired, it could only be prepared for experimentation only but not suitable for consumption. Otherwise, just for kid’s learning and play’s sake under adult supervision, the toy is a good bet. Christmas is a season for all to be merry and joyfully share our heartfelt affection. With great ardor, we all love to show our love and respect in the form of presents. As the countdown for this season of never-ending joy begins, people start rushing to stores to buy their desired products. Gladly, the internet has become the ultimate marketplace to buy any sort of present. It gives you a variety of options to choose from at any price – that comes under your budget. Everything seems to be going according to plan, but now that your kid has become a teen, choosing the perfect present can be a problem. We all have been at the stage where teens are always nagging about everything – especially Christmas presents. It’s one of those things they’ve been waiting for all year long. What is the point in giving your teen the present he/she doesn’t adore? You can easily avoid that grumpy feeling if you gift your teen something better than he/she has on their wish list. Let’s turn the tables this Christmas and make this one your kid’s best. Here’s the list of top 5 best Christmas presents for your teen, for which your kid would want to return the love. This new technological gadget tops the list with its exciting features and the fun it guarantees to kids and adults alike. You can consider it an advanced form of the skateboard, only with safety measures intact. Moreover, hover-boards are considered a must-have for every cool teenager these days. What makes you think your kid wouldn’t want one too? Not sure which one to choose? Check out this article for the top 10 hover-boards! Teens nowadays are obsessed with selfies and social media. There’s one thing they complain about – bad quality photos. They can’t nag anymore if you get them a smartphone lens kit to enhance their photo quality and become a social media sensation. Learn more about smartphone lens kits in this interesting article by Travel+Leisure. One of the naggings of teenagers is about their earphones always twisting and tangling in their pockets. You can free them of this hassle. How? Just get them one of those nice and stylish wireless Bluetooth headsets. Not only do they look cool, but are best suited for a teenager’s need. Amazon has some amazing wireless Bluetooth headsets. Go and check them out! If your teen likes doodling when he/she is bored, give them a proper material for it. Your teen can explore the depths of his/her artistic imagination and can keep scribbling and doodling on their perfect doodle book. Nifty, isn’t it? Do you think doodling will be just a way of passing time for your teen? Think again! A study was conducted by Applied Cognitive Psychology in which forty individuals were requested to observe a monotonous telephonic message. Out of these forty people, twenty individuals were requested to doodle during the testing. It was observed that those who were doodling had a 29% higher retention rate than the others. Whether your teen is a girl or a boy, none of them can say no to dandy and geeky metal glasses. These are so trending these days; if your kid is short or long-sighted, lucky for them to get a prescription lens in their cool glasses. Here are some of my favourite geeky metal glasses! This Christmas, gift your child something they won’t roll their eyes at. From the above list, you can see how picky and choosy teens can be handled easily. After all, it’s not just about the presents; it’s also the love and affection offered with them. Choose wisely and carefully and strengthen your bond with your teen this holiday. Happy Holidays! Get the Super-brain you always wanted with Yoga!